Brassy and a bit crass, crude and more than occasionally rude. That’s how many people in Northern California see their Southern California state mates. Snobbish and condescending, narrow-minded and old-fashioned, and, even worse, not quite real Californians is how some in Southern California see their compatriots up north. Yes, for decades there has been a war of words, and occasionally more than words, between Northern and Southern California, with the main players in the battle being San Francisco and its hinterlands versus Los Angeles and its. The war between Northern and Southern California has amused, perturbed, and puzzled many. Much about the dispute can come across as amusing, like a late night talk show monologue. 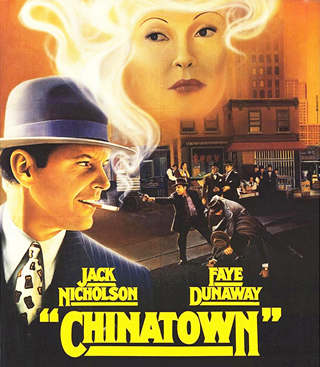 Rancor between north and south can be traced back to the water wars of the early 1900s, made notorious in the film Chinatown. Up North, it’s been said, women let their hair grow gray naturally. Down south they imbibe botox to fluff up their lips and cheeks. Some of the rancor traces back to the water wars that periodically convulse the state, as thirsty Southern Californians continue to seek new ways of channeling Northern California’s mountain streams south through the Delta and canals. Although much of the water goes not to L.A. but to Central Valley farmers, Los Angeles’ chicanery in stealing water from Owens Valley a century ago, made notorious by the film Chinatown, reverberates with some people up north. 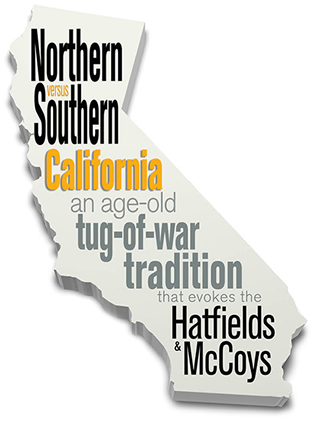 “It’s as if two regions are fighting each others’ stereotypes,” Jon Winokur wrote in his amusing 2004 tome on the subject, The War Between the State: Northern California vs. Southern California.